The Pauper's Castle: Why We Walk! Won't you join us? This is not my normal post, but I received some very sad news today and had to share. Sorry to say that Josh and Sarah lost their baby Sunday morning around 11:40 am due to a condition called Preeclampslia. Sarah was about half way into the pregnancy and everything was seemed to be going fine. Sarah thought she had caught a flu bug and wasn't feeling very well and Josh and Sarah didn't think to much about it. They call their doctor to see if they should do anything and he asked if she was dehydrated, he wanted to know if she wanted to come in, she didn't think she needed to. The next evening latter in the night she began to have some abdominal discomfort so she call a friend that is a nurse practitioner she told them to go to the emergency room to get it checked out just to be safe, they got to the hospital around midnight Saturday. Thank goodness they listened to her, Sarah was into the onset of a very severe case of Preeclampsia which greatly endangers the life of the mother. Her white cell count was dropping rapidly and she was in danger of internal bleeding and/or stroke and mother and baby could be lost. Susan and I arrived at the hospital around 7:00 am, Sarah's parents had been there since 5:00 am a team doctors ran test twice to see if her condition was improving or getting worse. Their first priority is the mother, then the baby. The strange thing about the whole thing was to look at Sarah was that she looked perfectly healthy and outside of the discomfort she was having from a very stolen liver (which also was endanger of bursting). Her white cell count had dropped below 60 thousand the danger level and she went into surgery for a c-section. The baby had only a 5% chance survival and a 95% chance of birth defects if it did survive. Just 4 more days would have increased the survival rate by 50%, but it was not meant to be. Baby girl, Bernadette was born somewhere around 10:00 am Sunday morning. Everyone got to see her and hold her while she was with us. If your event can help raise awareness and educate prospective mothers, then I'm happy to help. I would walk; however, I will be out of town that weekend. My one wish was that I could have seen Baby Bernadette; however, the events took place up in Chicago. Hugs 'n Kisses to Naomie (oh, okay, to you and Todd, too! :). It seems like I hear more and more about those that have been touched by this horrible complication of pregnancy. I don't know why, unless I am just more sensitive to it since I suffered from postpartum preeclampsia, but it seems like at least once a month, I am running into someone that has been touched by this. However, it doesn't seem that the media or the medical industry give it near enough coverage. For those of you that are not familiar....Preeclampsia is a disorder that occurs only during pregnancy and the postpartum period and affects both the mother and the unborn baby. Affecting at least 5-8% of all pregnancies (1 in 12 pregnancies), it is a rapidly progressive condition characterized by high blood pressure and the presence of protein in the urine. Swelling, sudden weight gain, headaches and changes in vision are important symptoms; however, some women with rapidly advancing disease report few symptoms. 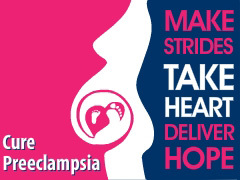 Would you please help us raise awareness about Preeclampsia? Please email this to your family and friends, post this to your Facebook page, post to your twitter page or what ever other means of publicity you can think of. Help us make strides and deliver hope! Thank you for helping me raise awareness! A special thank you to my friend Carrie for her generous donation! Hugs~Carrie! My thoughts and prayers go out to my friends family during this very difficult time!